The basic concepts of the show are still there, but that is about it. CHiPs is raw and action packed and wears it’s R-rated badge with pride. In 1977 Eric Estrada and Larry Wilcox were the "coolest cops" on television. CHiPs was a favorite for many and made stars out of the two young actors. As with so many older things these days, an updated version of the show made its way to movie theaters this year and is now coming out on Blu-ray Combo pack. While nothing is usually as good as the original, Writer, Director and Star Dax Shepard (Parenthood) tries his best to update the story of friendship and adventure for modern-day audiences. We start this modern day telling of CHiPs in Miami, Florida where Ponch (Michael Peña; Ant-Man) is an undercover FBI agent closing up an investigation into bank robbery when he gets reassigned to go undercover in the California Highway Patrol to root out corruption that appears to be going on in the division. Enter Jon (Shepard), an unsuspecting rookie cop, who barely made it through the academy and who is just lucky enough to be assigned to partner-up with Ponch. As you can image, personalities clash, hijinks ensue, and by the end of the day the bad guys are caught and Ponch and Jon have saved the day. 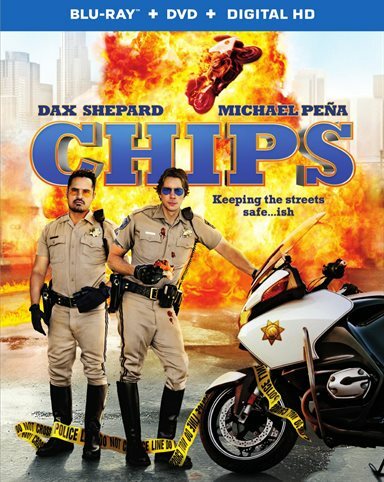 This new version of CHiPs grew out of Dax Shepard's love of the classic television show when he was a child as well as his love of motorcycles. It was only when writing a screenplay for another film did it click that he should be the one to tell this story to modern day audiences. However, one of his main concerns was how to update the film for a more cynical time. It was at this point he decided to reimagine the story. The basic concepts of the show are still there, but that is about it. CHiPs is raw and action packed and wears its R-rated badge with pride. The Blu-ray combo pack is present in 1080p AVC codec. As with most modern releases, there are no visible signs of artificating to the naked eye. Blacks are spot on and the details are clear and crisp. This especially was evident during some of the daytime scenes which feature more of the cast in their California Highway Patrol (all brown) uniforms. The audio is presented in Dolby Digital 5.1 and is a very decent mix keeping the dialog situated on the center channel and the special effects on the rest. At no point did the soundtrack overpower any other part of the film. Practical Pursuit – A long into the practical effects and stunts used in the film. Ducati: The Perfect Bike – A five-minute featurette that looks at the Ducati motorcycles featured in the film. Deleted Scenes – A mixture of deleted scenes that for one reason or other had to be taken out for pacing and time. Includes an introduction by Director, writer, and star Dax Shepard. While I was not the biggest fan of CHiPs growing up I did appreciate the care and love Shepard put into making this film. This modern version did up the ante in terms of crudeness and action scenes though. While it might not be up there as one of the best films of the year it certainly is good for a few good laughs one night when you are home and have nothing else to do. Download CHiPs from the iTunes Store in Digial HD. For more information about CHiPs visit the FlickDirect Movie Database.